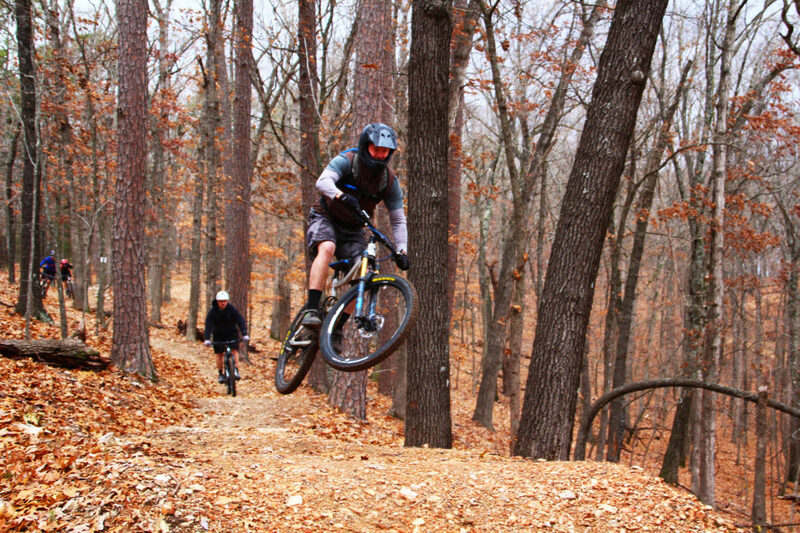 Arkansas has yet ANOTHER great, new mountain bike trail system. And this one packs some serious features. 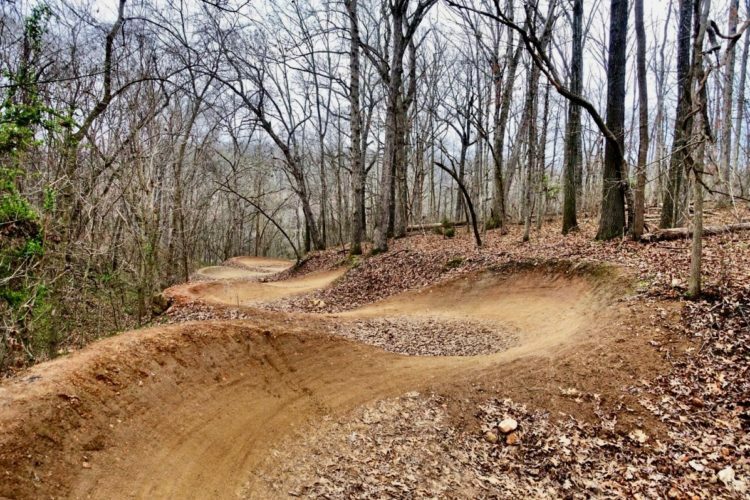 The Lake Leatherwood Gravity Trails Project (LLGTP) is complete and open for business. Aaron Rogers and his Rock Solid Trail Contractors crew constructed the final features this fall: a pair of native-rock, temple-like hubs located at the entrance to two different sets of downhill runs. 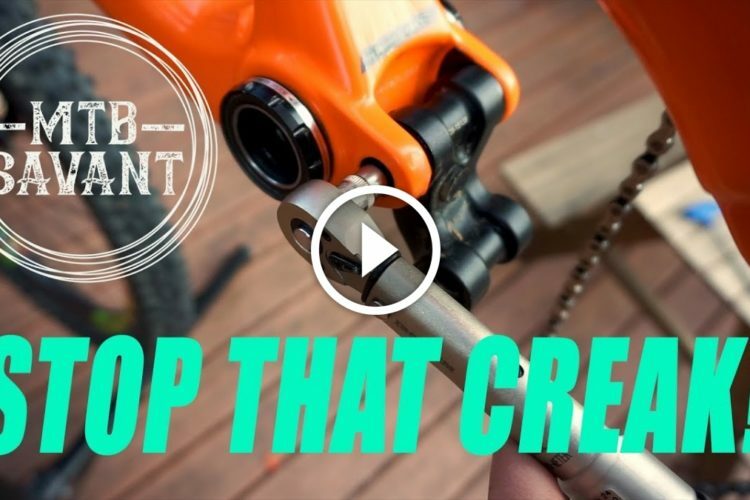 With the boost these hubs provide, cyclists will launch their high speed downhill adventure with just the stroke of a pedal. The seven new downhill, feature-packed trails are guaranteed to elevate riders’ adrenaline and push their skills, without forcing them to endure the payback of pedaling back up the mountain thanks to an easy shuttle route. Yes, downhill mountain bike thrill junkies in the central section of the country no longer need to trek out west to get their fix. They can visit the eclectic city of Eureka Springs, Arkansas. The new downhill trails are progressive in design, with one beginner, two intermediate, three advanced, and one expert trail, sure to please the palate of any downhill connoisseur. Both beginners and experts alike will want to start their adventure with DH 6, a nice flowy and fast green-rated trail filled with high earthen berms and rollers. There’s nothing too technical on DH 6, but it’s challenging enough for riders to hone skills before tackling the more aggressive runs. When you’re ready to up your game, move on over to DH 4 and DH 5, which are blue runs. These runs ratchet up the speed and technical aspects with short air gaps, smallish drops, chunky rock gardens, and more high, earthen berms. Then, for those who dare, when leaving the shuttle dropoff take the short pedal over to the south hub for DH 1, DH 2, and DH 3, which are all black diamonds. These are not the same mountain bike trails your daddy rode. 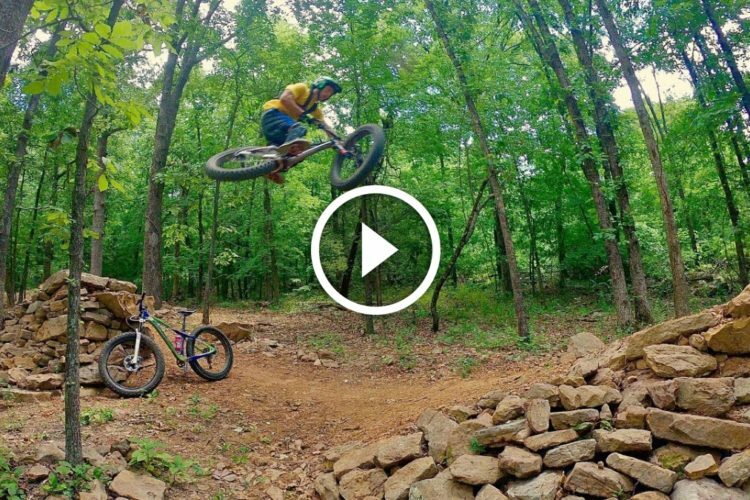 For riders possessing the right skills, this set of runs jack up the fun meter. They feature several massive gap jumps, technical rock slab descents, narrow rock ledges, lots of kickers, a unique pirate’s log plank drop, and plenty of towering earthen banked turns. All the jumps on these runs have ride-arounds, however even the ride-arounds include some pretty technical rock slab descents that riders will have to navigate. Then there is DH 7, a double black diamond, super fast descent with the most challenging jumps, gaps, and rock slab sections of all the trails. Discover for yourself why this is a double diamond. 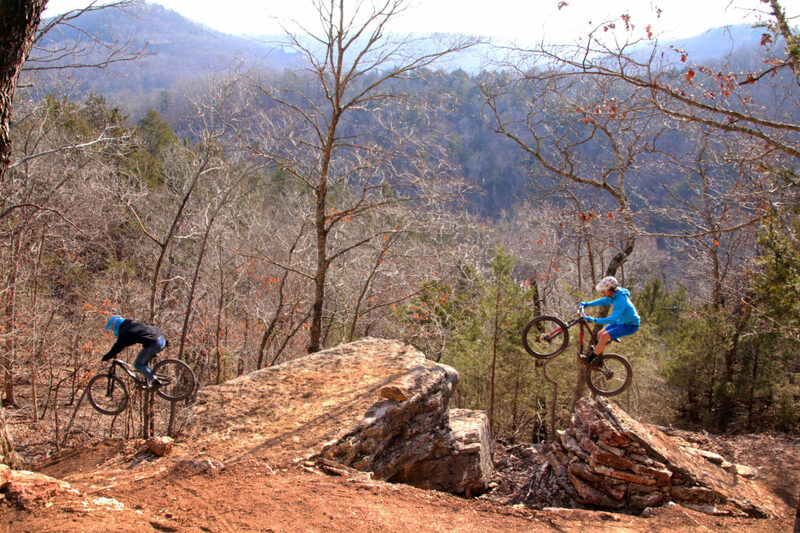 For most mountain bikers around the country, the explosion of new and innovative mountain bike trails in Arkansas may appear to be an overnight success story. However, the growth the Natural State has experienced in construction of new trail systems over the past two years was decades in the making. 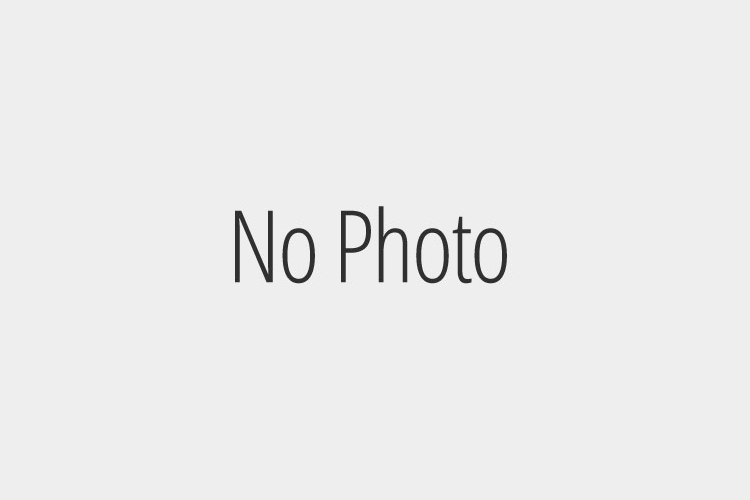 The LLGTP is a great example. Although actual trail construction took only a single year, trail planning took years, and it followed a set of proven processes. Justin Huss, Executive Director of Eureka Springs Parks & Recreation Commission, explained it best when he stated that before you can expect businesses and citizens to contribute money to a new trail project, you have to demonstrate that you are a reliable partner and also present a plan that will benefit their community. 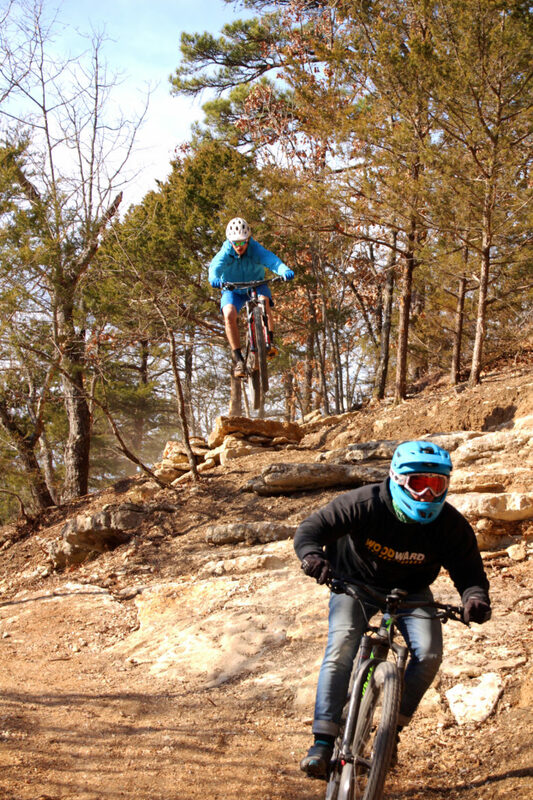 The Ozark Off Road Cyclists (OORC) began work to establish themselves as a credible partner over 20 years ago, when OORC President Dave Renko approached the city of Eureka Springs with an idea to put on a mountain bike race at the city’s Lake Leatherwood Park. 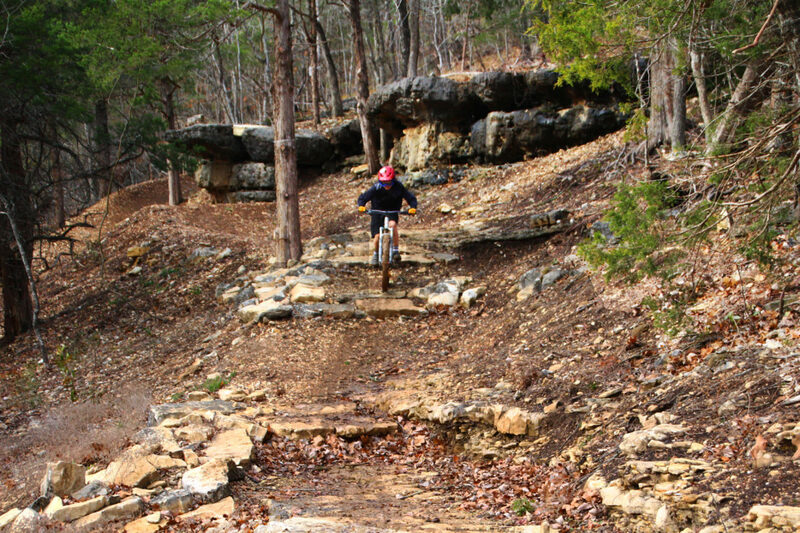 With the Eureka Springs Fat Tire Mountain Bike Festival celebrating its 20th year in 2018, successful in part due to the expanded network of trails OORC is responsible for constructing, you can believe OORC has established bankable cred with the city. 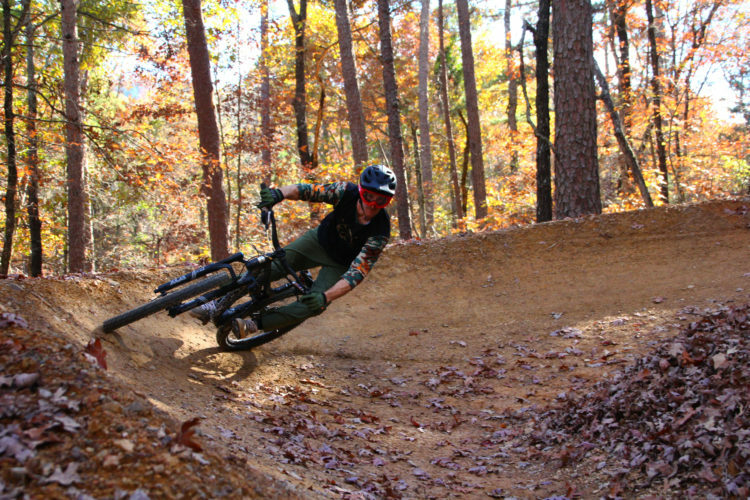 So, when Huss returned from a National Parks conference held in New Orleans, LA, where he heard of the successes parks out west were experiencing with developing downhill mountain bike trails, he contacted Brannon Pack, Executive Director at OORC, with the idea of doing something similar at Lake Leatherwood Park (which is the second largest city park in Arkansas). Before approaching the city, Huss and Pack both knew they needed a detailed, professional project plan to present along with the idea. 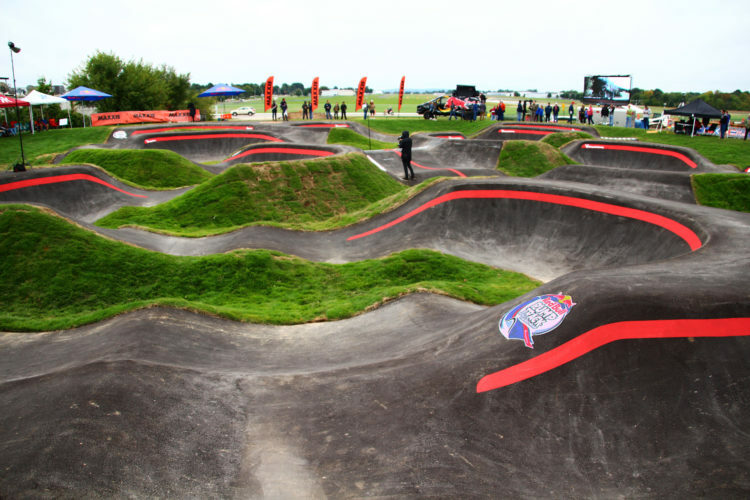 They then brought together other players from the mountain bike community and its supporters to help prepare this plan. From this collaboration they learned that Rock Solid Trail Contractors were already working on trails in northwest Arkansas. They invited this crew of trail builders to join them in determining how to best utilize the hilly terrain within the park with a goal of creating a unique set of trails that would attract mountain bikers. From this merging of like minds, they realized that the big draw for these downhill trails was that theirs would be the only downhill trails in the three state area with the environment capable of providing a shuttle service. Cyclists can load up at the bottom of the run then get a ride up to either of the two mountaintop trail hubs. With tourism being the main economic driver in the city of Eureka Springs, Huss was now confident he was prepared to present a project plan that the city would see as an opportunity to create a new market for visitors. The city administrators approved the plan. At this point they had a professional project plan to shop around to solicit potential sponsors. 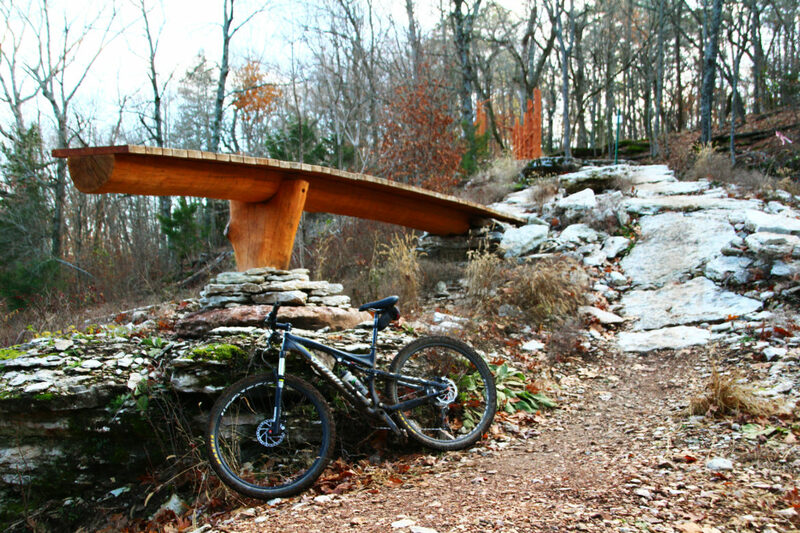 With both the proven reputation of OORC and the support of the city of Eureka Springs proposing the trails, the Walton Family Foundation agreed to provide a matching grant to construct the Lake Leatherwoods Gravity Trails Project trail system for a total cost of $655,469. Eureka Springs was able to fulfill their portion of the grant with funds collected from a permanent tax already in place for Lake Leatherwood improvements. The city is quickly experiencing an increase in visitors. Bike racks are being installed throughout the city to accommodate this new breed of tourist, and the city is on the road to becoming a popular mountain bike destination. 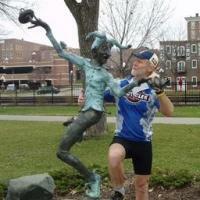 When I visited the LLGTP earlier this month, I met a group of cyclists from Minnesota enjoying the downhill runs. 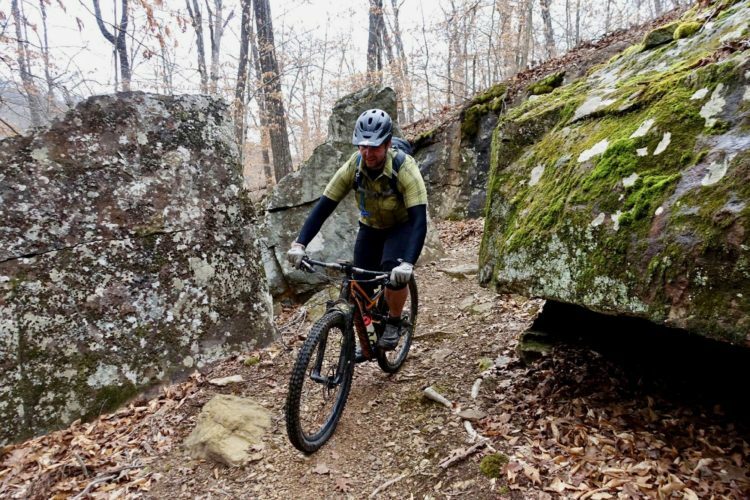 They were already including these trails on the list of trail systems to hit on their annual visit to Arkansas. New trails coming to Philpott Lake, VA: You can help! These are the most feature packed trails I have ever seen. There are so many optional lines you will stay entertained way longer than the mile of trails would have you believe. Oh and there is a campground onsite. This place is as good as it gets.